After nearly 2 years of development, EncrypGen has successfully built and launched the world’s first blockchain based genomic data marketplace. The Gene-Chain DNA Data Marketplace connects individual DNA data owners directly with researchers and buyers in a free market. For the first time in history doctors, scientists, pharma labs, universities, and research labs of all sizes can search for and buy de-identified raw DNA data and phenotypic genomic profiles. Putting control and compensation for access to data in the hands of DNA data owners, and giving research labs of all sizes access to a more diverse range of data is key to our mission to accelerate scientific discovery, advance precision medicine, find better treatments and discover cures for diseases like Alzheimer’s, Breast Cancer, Diabetes and Parkinson’s that impact millions of families every year. With that in mind, I invite you to join the Gene-Chain Marketplace today. I truly believe that by sharing genomic data in an open marketplace, we can achieve things that will benefit all of humankind. 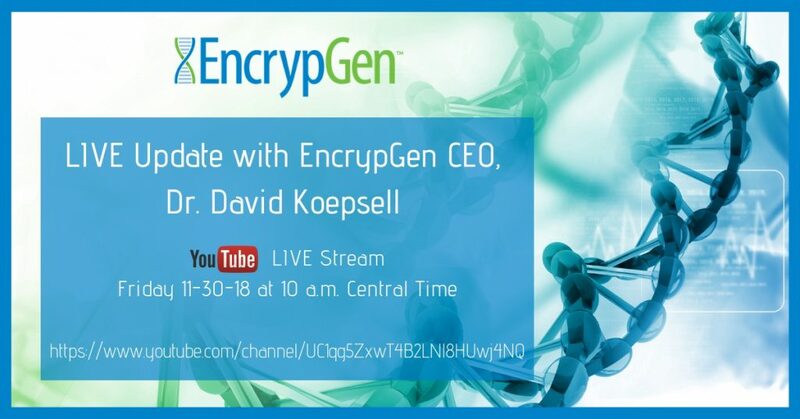 I’ll be talking more about the Gene-Chain platform and answering questions live in a YouTube LIVE Stream event today (Nov. 30th) at 10 a.m. Central Time. Watch it. If catch it LIVE, send your questions via our Telegram channel EncrypgenDNA. Learn more about becoming a data seller, data buyer or Gene-Chain Marketplace partner.